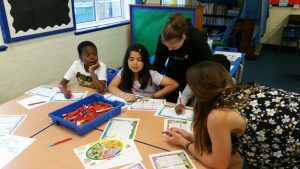 Last month Chartwells teamed up with Sustainable Merton and The Shine Trust to deliver nutrition and healthy eating activities to primary-aged children in Mitcham during the summer holidays. 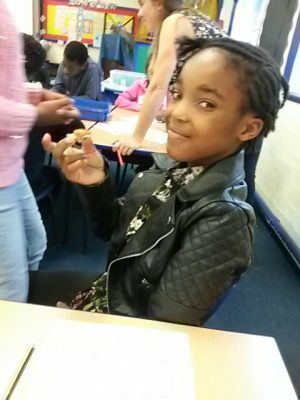 SHINE is an education charity that helps raise the attainment and aspiration of disadvantaged young people by providing them with extra support and creative learning opportunities after school, on Saturdays and in the school holidays. As part of a healthy schools summer project, fifty children from seven Mitcham schools took part in sports, nutrition, cooking and gardening sessions throughout the week, where they got a taste for gardening and experimenting with new foods. 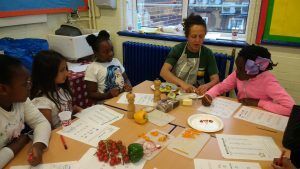 Chartwells Nutritionist, Emma Hookham, led sessions focusing on sugar swaps, food label reading, taste testing and menu creation. One of the activities involved giving children a sneak peek of their new menu for the following term, where they were asked to share their thoughts and feedback as a group. After learning more about the nutritional standards to which each school menu must comply, children were invited to invent their own one-week menu, taking the standards into consideration. Emma said “the children came from seven primary schools where we do the catering, so this activity was a fantastic opportunity to learn more about their likes and dislikes and ideas for improvement. It was also great to be able to explain why we can't have chips on the menu every day and why they'll find salmon or another oily fish on their menu at least once every three weeks. They understood that menus can be quite difficult to put together when all of these things needed to be taken into account”. Children also had a go at making their own healthy sandwiches using rye bread, avocado and a range of vegetables supplied by Chartwells. Although there was some scepticism at first, after taste-testing their creations they were pleasantly surprised and we achieved plenty of 'thumbs up' around the table. One child told us that “I didn't think I'd like the avocado but it tasted better than I thought. I’ve learned that it contains lots of healthy fats that are good for my brain and concentration". By the end of the week, there were many good food stories being shared. Children recounting fruit and vegetables they had tried that week, which they hadn’t tried before, and stories of how they had helped prepare the vegetables for dinner at home, using their newly acquired peeling skills. We thoroughly enjoyed our time at Shine, and hope the children did too!